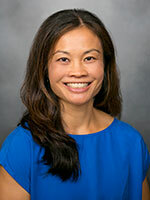 Marilyn L. Kwan, PhD, is a Research Scientist III (equivalent to Professor academic rank) at the Division of Research, Kaiser Permanente Northern California. She graduated from University of California, Berkeley, with her PhD in Epidemiology in May 2004 and completed a one-year postdoctoral fellowship in September 2005, also at UC Berkeley. Dr. Kwan joined the Division of Research in July 2005, where her current research focus is breast and bladder cancer prognosis and survival. Specifically, her interests include lifestyle and molecular factors and their associations with cancer recurrence, survival, and quality of life. She also studies the long-term health effects of cancer treatment specifically lymphedema, fractures, and cardiovascular disease, in breast cancer survivors. Dr. Kwan’s research has been funded by the National Cancer Institute, American Cancer Society, and California Breast Cancer Research Program. This study will comprehensively examine clinical and behavioral predictors of cardiovascular disease (CVD) outcomes among breast cancer survivors, and will maximize unique patient and data resources available at Kaiser Permanente Northern California (KPNC). We will compare CVD events in the Pathways Study, a cohort of female KPNC members age ≥21 years diagnosed with invasive breast cancer (n=4,453, R01CA105274) with CVD events in a new age, race/ethnicity, history of comorbidity, and length of KPNC membership matched cohort of healthy KPNC female members (n=22,265). Results from this study will have important implications for identifying breast cancer subgroups at high risk of CVD and identifying potential targets for intervention, such as medication adherence and control of CVD risk factors. The objectives of this retrospective cohort study of an established case-control study of childhood leukemia are to understand the relationships among immune status at birth, infectious exposures during childhood, and leukemogenesis, and to use this understanding to decrease the incidence of childhood acute lymphoblastic leukemia (ALL). The aims are to: 1) Assess whether a low interleukin-10 level at birth is associated with an increased incidence of early infections characterized by severe clinical symptoms from medical records and self-report; and 2) Determine whether decreased interleukin-10 can contribute to increased ALL in the setting of immune system activation. The aims of this multiple PI grant are to: 1) Evaluate patterns of medical imaging (utilization and radiation dose) and estimate cumulative exposure to ionizing radiation from medical imaging in a) children (0-18 years old) and b) pregnant women, from 1996-2016; 2) Determine the risk of childhood leukemia among children and adolescents following exposure to all medical imaging examinations that deliver ionizing radiation from 1996-2016 and followed through 2017. We will also examine effects due to exposure from CT exams alone; 3) Determine the risk of childhood cancers among children and adolescents following fetal, in utero (maternal pregnancy) exposure to medical imaging from 1996-2016 followed through 2017; 4) In the subset of the population with complete information during in utero and child or adolescent exposure to medical imaging, assess the cumulative impact of these exposures on childhood cancers. This study involves a new prospective cohort of more than 1,800 non-muscle invasive bladder cancer cases to investigate the role of cruciferous vegetable intake, along with associated individual genetic profiles, on reducing recurrence and progression of disease and improving the efficacy of current treatment modalities. This project will investigate the impact of modifiable lifestyle factors, germline genetic variations, and serum biomarkers, on adverse skeletal outcomes among aromatase inhibitor users, as well as develop a prediction model for risk of fractures for postmenopausal breast cancer patients taking aromatase inhibitors. This mixed-method, comparative effectiveness study will compare costs, complications, patient- and family-centered outcomes related to urinary diversion. Study participants will include bladder cancer patients undergoing cystectomy and their family caregivers within three Kaiser Permanente regions with a membership base of over six million enrollees. Breast Cancer Res Treat. 2016 Jul 22. J Natl Cancer Inst. 2015 Jul;107(7). Epub 2015-04-28. Am J Epidemiol. 2014 Jan 1;179(1):95-111. Epub 2013-10-09. The Be-Well Study: a prospective cohort study of lifestyle and genetic factors to reduce the risk of recurrence and progression of non-muscle-invasive bladder cancer. Cancer causes & control : CCC. 2019 Feb ;30(2):187-193. Epub 2019-01-17. J Pain Symptom Manage. 2018 Nov 30. Urology. 2018 Nov 22;169(12):855-865. Epub 2018-11-22. Urol Oncol. 2018 Apr 24. Breast Cancer Res Treat. 2018 Apr 18. Author(s): Check DK; Kwan ML; Roh JM; Ergas IJ; Kushi LH; et al. Breast Cancer Res Treat. 2018 Apr 05. Am J Hum Biol. 2017 Sep 08. Cancer Epidemiol Biomarkers Prev. 2017 Sep;26(9):1466-1469. Cancer Causes Control. 2017 Mar 27. Cancer Epidemiol Biomarkers Prev. 2017 Feb 02. J Natl Cancer Inst. 2017 Feb 01;109(2):1-8. Breast Cancer Res Treat. 2016 Dec 03. JAMA Oncol. 2016 Nov 10. Am J Hum Biol. 2016 Jul 15. JAMA Oncol. 2016 May 19. JAMA Oncol. 2016 May 12. Cancer Epidemiol Biomarkers Prev. 2016 Apr 26. J Natl Cancer Inst. 2016 Mar;108(3). Epub 2015-12-01. Breast Cancer Res Treat. 2016 Feb;155(3):551-7. Epub 2016-02-10. Cancer Causes Control. 2016 Jan 21. J Natl Cancer Inst. 2016 Jan;108(1). Int J Cancer. 2015 Nov 25. BMC Cancer. 2015;15:688. Epub 2015-10-14. J Community Health. 2015 Jun 14. Cancer Epidemiol Biomarkers Prev. 2015 Jun 10. Cancer Epidemiol Biomarkers Prev. 2015 May 19. BMC Cancer. 2015;15:278. Epub 2015-04-14. Cancer Causes Control. 2015 Apr;26(4):529-39. Epub 2015-03-04. Cancer Epidemiol Biomarkers Prev. 2015 Feb;24(2):361-8. Epub 2014-11-25. J Natl Cancer Inst. 2015 Jan;108(1). Epub 2015-11-11. J Cancer Surviv. 2014 Dec;8(4):539-47. Epub 2014-05-08. BMC Cancer. 2014;14:382. Epub 2014-05-29. Cancer Epidemiol Biomarkers Prev. 2014 May;23(5):725-34. Epub 2014-02-12. Cancer Epidemiol Biomarkers Prev. 2014 May;23(5):714-24. Epub 2014-02-12. Breast Cancer Res Treat. 2014 Apr;144(3):689-99. Epub 2014-03-07. Cancer Causes Control. 2013 Oct;24(10):1821-36. Epub 2013-07-18. Cancer Epidemiol Biomarkers Prev. 2013 Aug;22(8):1451-6. Epub 2013 Jun 13. Breast Cancer Res Treat. 2013 Jun;139(2):529-37. Breast Cancer Res Treat. 2013 Jun;139(2):581-95. Psychooncology. 2013 Jun;22(6):1411-20. Epub 2012-08-22. J Natl Cancer Inst. 2013 May 1;105(9):616-23. Epub 2013 Mar 14. J Am Med Inform Assoc. 2013 Mar-Apr;20(2):349-55. Epub 2012 Jul 21. Cancer Epidemiol Biomarkers Prev. 2013 Jan;22(1):32-41. Epub 2012 Nov 13. Smoking and survival after breast cancer diagnosis: a prospective observational study and systematic review. Breast cancer research and treatment. 2012 Nov 10;136(2):521-33. Epub 2012-09-29. Cancer Causes Control. 2012 Sep;23(9):1587-91. Epub 2012 Jul 14. Breast Cancer Res Treat. 2012 Sep;135(2):591-602. Epub 2012 Aug 19. Cancer Epidemiol Biomarkers Prev. 2012 Aug;21(8):1260-71. Epub 2012 Jun 13. Cancer Epidemiol Biomarkers Prev. 2012 Jul;21(7):1115-25. Epub 2012 May 9. Am J Clin Nutr. 2012 Jul;96(1):123-32. Epub 2012 May 30. Cancer. 2012 Apr 15;118(8):2048-58. Epub 2011 Sep 27. Breast Cancer Res Treat. 2012 Apr;132(2):729-39. Epub 2011 Dec 21. Breast Cancer Res Treat. 2012 Feb;131(3):1029-38. Epub 2011 Oct 29. Breast Cancer Res Treat. 2012 Jan;131(2):679-90. Epub 2011 Sep 28. J Cancer Surviv. 2011 Dec;5(4):320-36. Epub 2011 Oct 16. Breast Cancer Res Treat. 2011 Nov;130(1):195-205. Epub 2011 May 11. Cancer Causes Control. 2011 Sep;22(9):1319-31. Epub 2011 Jun 28. Breast Cancer Res Treat. 2011 Apr;126(2):529-37. Epub 2010 Aug 28. Am J Epidemiol. 2010 Dec 1;172(11):1315-23. Epub 2010 Oct 11. J Clin Oncol. 2010 Oct 10;28(29):4410-6. Epub 2010 Aug 30. Breast Cancer Res Treat. 2010 Sep;123(2):507-24. Epub 2010 Feb 6. PLoS Genet. 2010 Jul 29;6(7):e1001043. Breast Cancer Res Treat. 2009 Nov;118(2):395-405. Epub 2009 Feb 17. Breast Cancer Res Treat. 2009 Oct;117(3):653-65. Epub 2009 Jan 31. Public Health Rep. 2009 Jul-Aug;124(4):503-14. Breast Cancer Res. 2009;11(3):R31. Epub 2009 May 22. J Clin Oncol. 2009 Feb 20;27(6):919-26. Epub 2008 Dec 29. Am J Surg Pathol. 2009 Feb;33(2):256-63. Breast Cancer Res Treat. 2008 Jun;109(3):573-9. Epub 2007 Aug 3. Cancer Causes Control. 2007 Aug;18(6):613-20. Epub 2007 Apr 3. Am J Epidemiol. 2007 Jan 1;165(1):27-35. Epub 2006 Oct 11. J Nutr. 2007 Jan;137(1 Suppl):236S-242S.